“Hi Wally, So, I tried installing Windows 8 on my HP laptop. Its an old computer but its within the system requirements for Windows 8. Wally’s Answer: Installing Windows can be a chore sometimes. Especially when it doesn’t go as smoothly as you might have hoped. 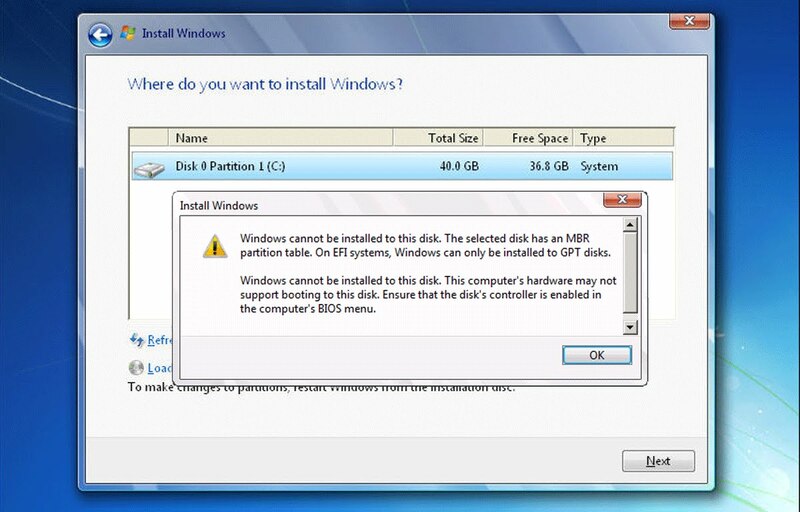 Here, we will be looking at how you can fix the ”Windows cannot be installed to this disk” error. This error appears when trying to install Windows 8 on a MBR partition. Windows 8 requires a GPT partition system. What Exactly are GPT and MBR? GPT and MBR are ways of storing partition information on your computer’s hard disk. MBR is an old standard. It can accommodate up to 4 TB. MBR was the standard on all Windows PCs, until Windows 8 was released. GPT is the new standard. It can accommodate as much data as Windows will allow it to store. MBR became obsolete after GPT started getting used in Windows PCs. You need to delete all the previous partitions and make new MBR partitions. You can do this from the Windows 8 (or Windows 10) setup screen. Please follow these instructions to use the command prompt solution. You can also delete old partitions and make new ones using third-party software like Minitools Partition Manager if using commands seems a bit difficult to you. Make sure that the new partitions you make are MBR and not GPT. Converting partitions will also delete all the data, rendering it unrecoverable. You should copy important data before converting the partitions. Click here to learn how to make a bootable Linux USB disk. This bootable Linux disk can be used to start Linux without installing it. After that, you can copy any and all important data onto an external USB hard drive or flash drive.